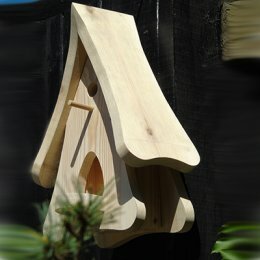 Oak Garden Bird Nesting Boxes and Bird Feeders. rewarding experience giving birds struggling to find somewhere suitable in their natural environment, a place to nest. Oak nesting boxes age gracefully, always looking beautiful and having a natural affinity with your garden. Wood is the only material used for the manufacture of bird feeders that is a renewable resource. Having bird feeders in your garden is a wonderful way to attract wildlife. The wild birds that that visit may nest in your garden or may be travelling in from further afield. Once they have seen your bird feeder, though, they will keep returning, and who knows, may even decide to stay. In winter, with its long cold nights and short days, birds need to find food as a priority. Particularly the smaller birds, like the Wren that has a high winter mortality rate. 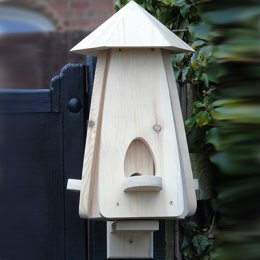 Most of our Blue Bird range of bird feeders have hoppers that enable you to load more feed than in conventional bird feeders. This feed is store in substantial quantities and in a dry enclosure. The feed slides easily down the hopper to the exit port as the birds eat the feed. 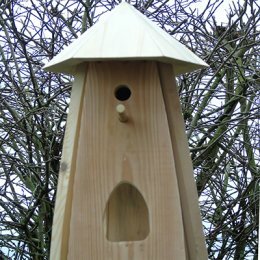 Oak Feeder & Nest Box.